The Phillips Collection hosted a Nordic Lights themed Phillips after 5 in February to celebrate our Nordic Initiative, a partnership with the embassies of Denmark, Finland, Iceland, Norway, and Sweden. Along with film, music, and food from the Nordic region, the event featured lamps created by artists and designers from each of the five Nordic countries. The lamps from Iceland were designed by Katrín Sigurđardóttir, an artist who will speak about her work at The Phillips Collection on March 27, 2014 as part our Conversations with Artists series. Sigurđardóttir, best known for her sculpture and installation pieces, questions our perceptions of space and time in her work. The lamps she designed are works of functional art titled Ísafjörður Series (2009), after Ísafjörður (“ice fjord” in English), an isolated town in northwest Iceland with a population around 2,600. Sigurđardóttir photographed a series of streetscapes or “village-scapes” of the town and transferred those images to the lasercut birch veneer that wraps around the shades of these lamps. 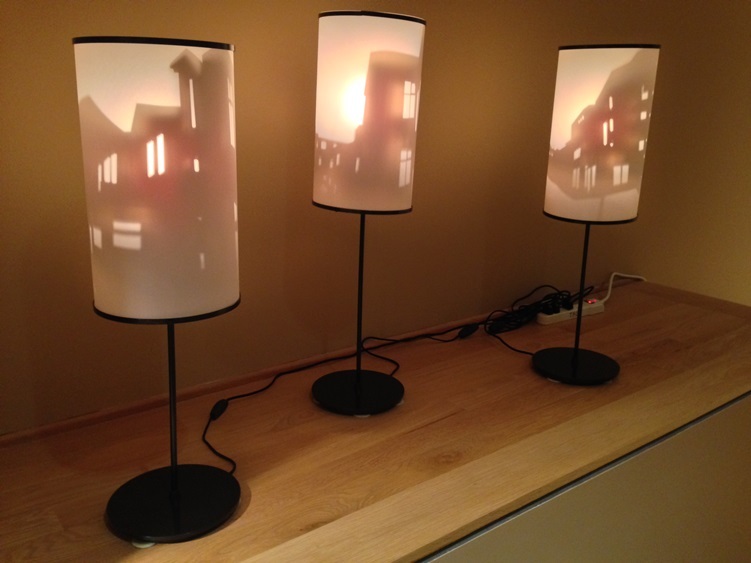 When illuminated, the lamps project photographic images laser cut into birch veneer onto their white vellum outer shades. Ísafjörður was a captivating subject for the artist because of the unique conditions there. The town is located among steep mountains and, due to its location, the town only sees sunlight for a few hours in the winter. In the summer, the sun never truly sets. With this series of lamps, the artist sought to capture the distinctive sense of time, light, and space experienced in Ísafjörður. To reserve tickets for Katrín Sigurđardóttir’s upcoming artist talk at the Phillips, visit the event page on our site.